Home > Car Audio > Subwoofers > 8"
If space is an issue, it does not mean you have to skimp on sound. You just need a smaller woofer, an 8" subwoofer has a small form factor that can fit in most custom boxes, and truck enclosures. 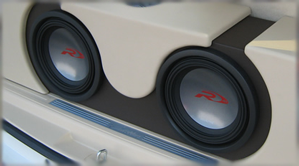 An 8 inch subwoofer will provide your audio system with clean great sounding tight bass. We stock a wide variety of brands and types so you will easily be able to find exactly what you need to get the sound that you want.